"The last thing I want to talk about today is rather personal. Last week I said to not play Merfolk Branchwalker, yet people did. Even Dan Jessup disrespected me when he put four of them in his deck. So did Brennan DeCandio! Some even played it over Servant of the Conduit, which should have proven itself by now. What is it about this card that makes people think it's Standard playable? Sure I get it, people like drawing cards, but this only does that less than half the time. If it was a Silvergill Adept with no restrictions, I'd be all in, but it just isn't. Since this card is high variance and low impact relative to the rest of the format, it's just not a good two-drop. You need to guarantee you're getting what you expect out of your cards when playing green midrange decks. Take Servant of Conduit, for example. Even if they kill it or you trade it with another creature, you got the value out of it that you expected. If left untouched, you now have extra mana. In the same situation with a 3/2 Merfolk Branchwalker they won't respect its possibility to impact the game outside of combat. There's no tension anymore like a Servant of Conduit can produce. Your Merfolk Branchwalker most likely didn't do what you wanted, and thus isn't good enough for Standard play. Something not discussed enough in Magic is when cards are drawn later in the game. Of course two-drops aren't as impactful later in the game, and anyone who played Winding Constrictor knows this all too well. Merfolk Branchwalker becomes even more of a liability as it's almost a dead card later in the game unless it drew a card. In a midrange strategy you're looking for creatures you can deploy early as the strategy intends but also give some value later in the game. Sure Merfolk Branchwalker will sometimes cantrip, but when it doesn't, it's horrific. Of course the same argument can be made about Servant of the Conduit given it's no longer played with Energy "dumps," but that doesn't mean Merfolk Branchwalker is playable given this argument. Deck designing doesn't have to live in a space where a card like this is necessary in a non-tribal strategy. If it's wanted, then the deck is designed poorly and something needs to change. I assure you this is just the way it is. You can keep playing this card, but just know you're wrong. If you have an argument to why I'm not correct, then please comment below. I look forward to destroying you." Let's start this like how every friendly debate should start in 2018: with personal attacks. You registered Nightshade Peddler in the not so distant past. Young Wolf even. A Conley Woods special featuring the speed it up / slow it down combo of Putrid Leech and Mulldrifter. That deck also had Caldera Hellion, which was good against exactly zero decks. You played Flamekin Harbinger in a Pro Tour (you're welcome, by the way). You even won money with (some of) those cards. Remember trying to make Trading Post happen? It's not gonna happen. Merfolk Branchwalker is definitely not the most egregious card you've ever registered, so why all the hate? Look, I tried Merfolk Branchwalker when Ixalan came out and it disappointed. It lost basically every fight, from Glint-Sleeve Siphoner to Longtusk Cub to Whirler Virtuoso. Those cards had way more value going long. The minor value you picked up didn't compete with the other things you could be doing for two mana. Sticking to that memory of "Merfolk Branchwalker is bad" is dangerous territory. If there's anything Magic has taught me, it's how quickly evaluations fluctuate. Magic cards don't exist in a vacuum. Things have changed and Merfolk Branchwalker is now actively good. 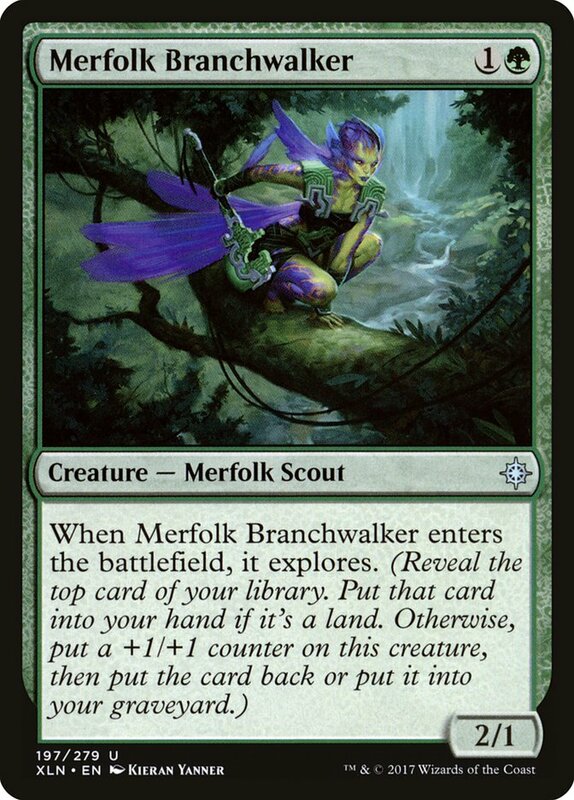 In 2002, Merfolk Branchwalker would have been the best green creature ever printed. We're not quite there, but energy was nerfed and green decks need to fill their curves with something. There are two possible reasons why someone wouldn't like Merfolk Branchwalker: the inherent variance offends their delicate sensibilities; or the power level doesn't excite them because there are better options. I get it. Casting a spell with a random effect is scary business. You never know what side you're going to get, but that's why you shouldn't bank on either and be happy with whatever the worst case scenario is. There's a cycle of cards in The Elder Scrolls: Legends (the allies, for those who play) that are very similar to Merfolk Branchwalker in play pattern. If the top card of your deck is the same color, they get a bonus, typically in stats. The game features direct attacking, so sometimes you're in a position where you need to hit with an ally to stabilize. Even if you're 90% to hit, that's not 100%, so sometimes they get to eat your creature for free and the game snowballs out of control. However, the blue one, Cunning Ally, is different. It's always a 3/3, and if your top card is blue, you draw a Shock. That leads to you never playing Cunning Ally when it can lead to getting blown out. Cunning Ally inherently teaches you to never bank on the best case scenario. Instead, play the card when there is no bad outcome. That's exactly how Merfolk Branchwalker should operate in your decks. Disliking Merfolk Branchwalker because of the variance is like quitting Magic because you can't handle the swings of a random draw step each turn. It might go against your spiky sensibilities to play a card that doesn't necessarily make you feel clever or in control, but that doesn't automatically eliminate Merfolk Branchwalker as an option. The trick isn't to expect one option or the other. You know all possible outcomes of the card, so you can operate with knowledge of both the ceiling and floor. There is no variance involved. As far as power level is concerned, Merfolk Branchwalker passes. Have you tried building green decks in this format? Most of the cards stink! Green used to be a huge portion of the metagame share, but Tireless Tracker rotating and energy getting nerfed reduced it to bare bones. If you decide you absolutely want to play green, you're going to need to sacrifice. Is Merfolk Branchwalker as good as Longtusk Cub or Servant of the Conduit? No! And no one is saying that. They each have their pros and cons, and last weekend, Merfolk Branchwalker vastly outperformed the competition. Servant of the Conduit and Aether Hub are a significantly worse package without Attune with Aether. You'll run out of energy quickly and have a bunch of colorless lands and Grizzly Bears. That doesn't necessarily eliminate them from consideration either, but at this point, all the great cards have been banned. Some part of your deck is likely going to be worse than you'd prefer. Not every card is going to be a hit in the late game, and that's one of the fun tensions in deckbuilding. Figuring out how to get to that point in the late game can be another. Merfolk Branchwalker isn't ideal for either, but it's a fine bridge and a much better topdeck than you're giving it credit for. Servant of the Conduit is also a poor topdeck and you mention that that alone shouldn't exclude it from your deck. The same is true of Merfolk Branchwalker. If you want to accelerate your mana, play Servant of the Conduit (or Channeler Initiate). If you want to crew Heart of Kiran (sometimes), play Merfolk Branchwalker. If you want to both accelerate your mana and hit your land drops because your end game is four copies of The Scarab God, play both. At SCG Dallas, the Jessups decided that four copies of The Scarab God was the correct end game for their Sultai Energy deck. "I just register Andrew's 75 in the dark now. He's always right." In order to make The Scarab God as good as it can be, you want to be able to hit your land drops and have a full graveyard. Do you see where this is going? The interaction with the graveyard isn't trivial either. Danny used Merfolk Branchwalker to get more fuel for The Scarab God. Brennan DeCandio used it to deposit Scrapheap Scrounger into the graveyard and feed it. The synergy with Nissa, Steward of Elements is also real. You can either ensure you draw a land off the explore or get a peek at your top card to know if a Nissa minus would hit. Initially, Nissa seemed out of place in the deck and unexpected, but with eight explore creatures, it makes a ton of sense. Tireless Tracker and Attune with Aether made things easy for green mages. Now we have to jump through some hoops to fix colors, make land drops, and gain velocity, but having that consistency is incredible. What Merfolk Branchwalker replaced in Sultai was Winding Constrictor, and to some extent, Walking Ballista. Whether or not that choice is correct is up for debate, but Merfolk Branchwalker definitely earned its place. Brennan DeCandio decided to play Merfolk Branchwalker in his G/R Monsters deck and it was a great choice for him too. "If you've ever been wrong before, consider that this might be one of those times." Certainly I'm considering that I'm in that position now, but it doesn't seem feasible. I filled out my decks with Merfolk Branchwalker, as did numerous other smart individuals. The card performed well for them, as expected. Most decks would play a two-mana Borderland Ranger. If 1G 3/2 ETB Scry 1 (to the graveyard) doesn't excite you, you're probably not building your decks correctly. Merfolk Branchwalker's value is mostly hidden, as are its synergies with key cards in these decks. Both decks would be much worse without Merfolk Branchwalker in them. That much is abundantly clear. It was fun destroying you, Bradley. I look forward to doing it again. I also look forward to seeing you get mana screwed on camera while your opponent has great draws thanks to ole Branchy. I especially look forward to whatever Standard Grand Prix you Top 8 with four Branchwalkers and your subsequent article about how great the card is, hoping people forget all about this. I'll make sure they don't.